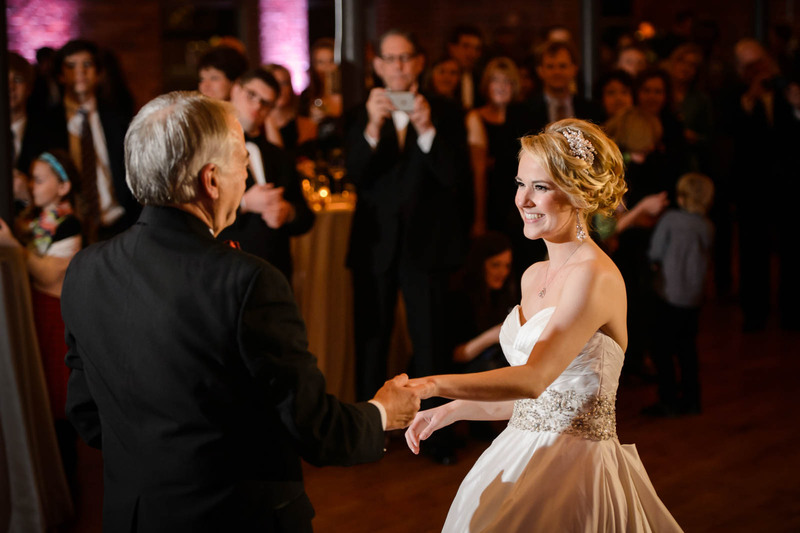 The bride happily smiles at her father mid-twirl during their father-daughter dance. This is one of my favorite parts about the wedding reception is the Father Daughter Dance. When the father and daughter take their dance right after giving her away to her now husband. This is such an emotional moment for everyone in the room. This bride and her dad were so close and so sweet together we knew the dance would be just so special. The bride and groom finished their first dance and then it was time for the father daughter dance. The song "Daddy's Angel" comes on and the bride reaches out for her dad to join her on the dance floor. They start to dance and emotions appear on everyones faces as they dance snuggled up together. Then he spins her and her dress flows so perfectly out and she reaches back with a huge smile on her face back at her dad as they continue to dance the night away.